In this post I’ll show you how to do image processing in 50 lines of C# code, or less. First, fire up LinqPad and start by importing System.Drawing. All other needed namespaces are imported by LinqPad. Then we need to change the script type from Expression to Program. This gives us the full expressive power of C#, including the ability to do statements, create methods, classes, structs, etc. The first lines defines the desktop folder path. The second line defines the path to an image I have on my desktop. The third is where the action starts. This line calls the Render method, passing along the droplet image and then a method delegate. The result of the call is dumped to the output. The Dump method is a special LinqPad extension method that normally outputs a textual representation of the state of the object being dumped out. It does however handle XML data and image data specially. In the case of image data it will show the data as an image. Next we define the Render method. Note that this is a straight-forward higher-order method that takes in a bitmap and a shader and gives back a new and shaded copy of the source bitmap. Well, that description is not entirely accurate. I’ve set it up so that it actually returns a stream of images. So far it will only return the source and target images but it can now be easily extended to generates animations, courtesy of iterators (see “yield return”). These are by no means opposites but in 50 lines of code, I’ll not show you parallel LINQ or parallel code. It is however easy to bolt on and I’ll leave this as an exercise to the reader. Beware that the Bitmap class is not thread-safe! The PixelShader is just a function from a coordinate set (x,y), a dimension (w,h) and a color to a new color. This representation lets you do a lot of magic but you can easily extend it to include a pixel matrix and a time parameter for added power. First we read out the alpha, red, green and blue pixel values, then we swap red and green and then we construct a new color from that. I’ve previously written against using methods with ref and out parameters but in some cases, they are quite useful. That’s it! – A compositional image processing script in 50 lines of code. This entry was posted in Uncategorized and tagged .Net, 2D, 3D, C#, Image Processing, LinkedIN, LINQPad, Parallel, Pixel shader. Bookmark the permalink. 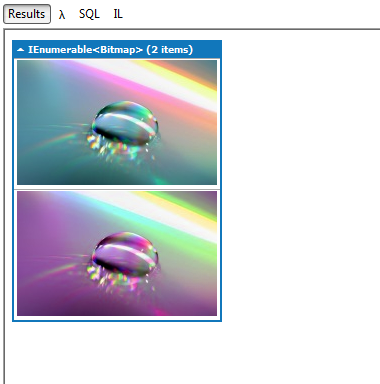 Note, you’ll need LinqPad version 4.28.3 or higher to do image processing with inline output. See the beta page.